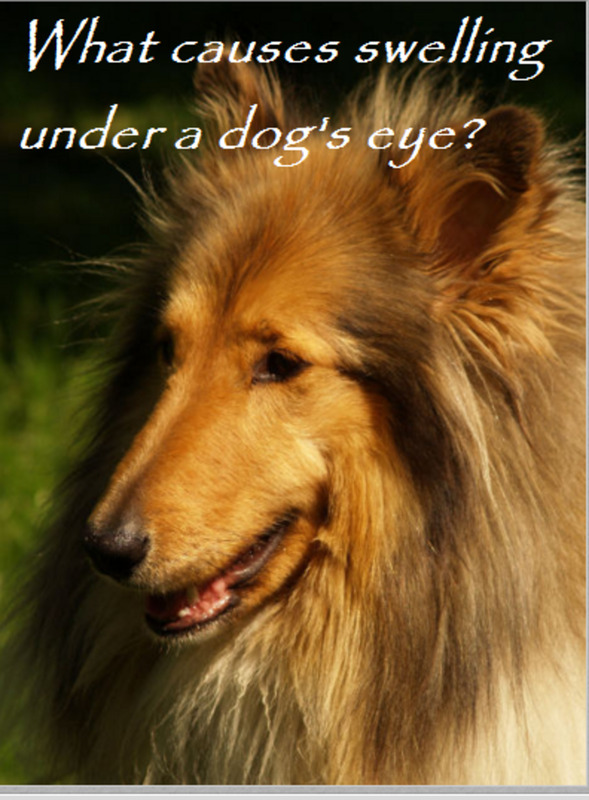 According to Animal Eye Care LLC dogs have two tear glands in each eye; whereas, humans have only one. The orbital tear gland is responsible for producing 60 percent of tears and the third eyelid tear gland produces 40 percent. 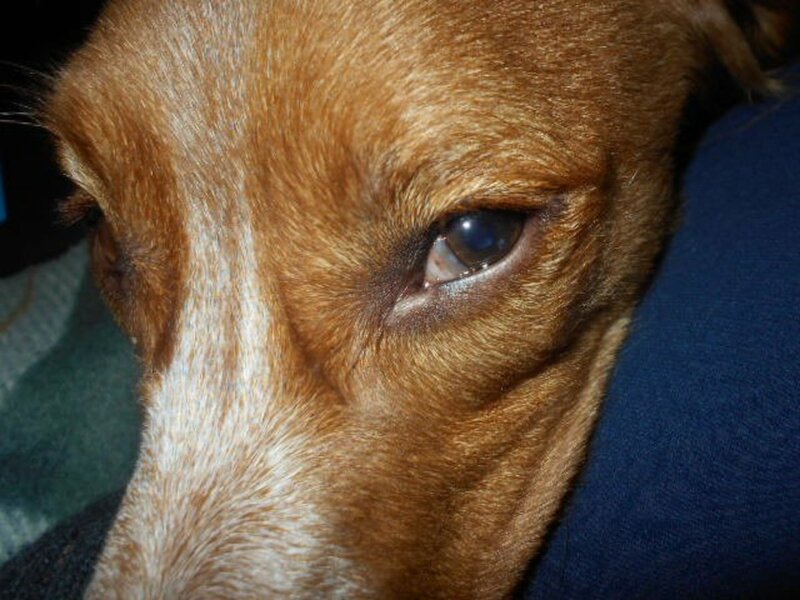 If your dog's third eyelid made a sudden appearance, you may be wondering what's going on. There are several possibilities that range from ocular problems to more systemic autoimmune or neurological disorders. The presence of the third eyelid could be a sign that the dog's eyeball has sunken into its socket, often because of pain and inflammation. The third eyelid covers the eye to protect it from further injury, as in the case of corneal trauma. It could also be that the structure meant to hold the third eyelid in place either weakened or got injured. A further possibility may include allergic conjunctivitis. Some dog breeds are prone to prolapse of a gland found in the dog's third eyelid, a condition known as "cherry eye" mostly because of its bright red presence resembling a cherry in the corner of the dog's eye. 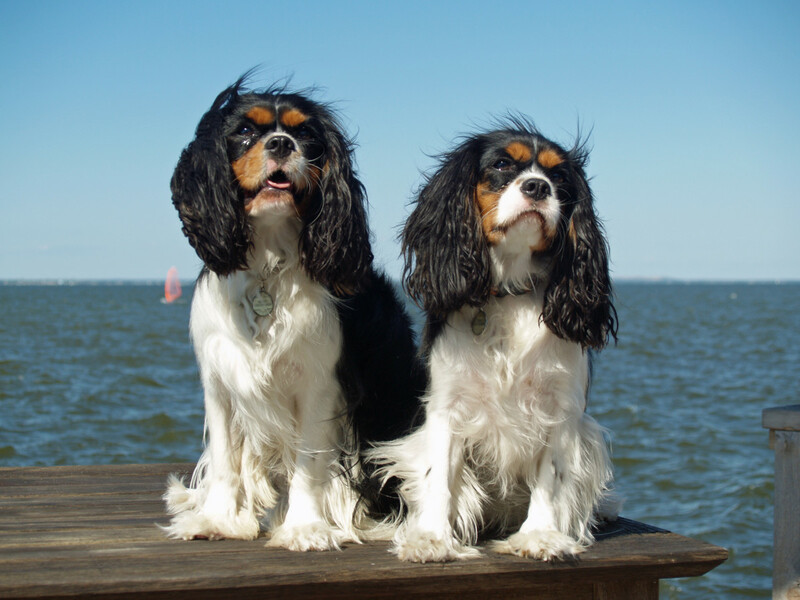 This is a congenital disorder found commonly in certain dog breeds such as cocker spaniels, beagles, Boston terriers, and bulldogs. What happens is the cartilage responsible for supporting the membrane folds over causing the third eyelid to no longer work well as a "windshield wiper." This results in a gland that is exposed and potentially inflamed. Some neurological diseases may cause loss of function to the nerve that supplies the third eyelid. Horner's syndrome is a common neurological disorder that occurs suddenly and is characterized by sunken eye, droopy eyelids, droopy facial features, small pupil size, and the prolapse of the third eyelid. Dilated blood vessels in the affected area cause owners to sometimes report that it feels warmer to the touch. The cause is unknown, but at times it can be triggered by trauma to the head, bite wounds, a herniated disc, a growth pressing on a nerve, a side effect of some medication, or a middle or inner ear disease. While any dog can develop Horner's, golden retrievers and cocker spaniels are slightly predisposed. Other neurological disorders that can cause a third eyelid to be exposed include tetanus and dysautonomia. Certain physical conditions that are known for relaxing the muscles found around the eyeball and for causing the settling of the eye deeper into its socket may be a cause for the appearance of the third eyelid. Dogs who are malnourished, dehydrated, who have lost weight or are generally not feeling well may manifest protrusion of the third eyelid. Treatment varies depending on the cause. In some cases, a cause is never found. These are referred to as "idiopathic." Sometimes the issue resolves on its own after several weeks. 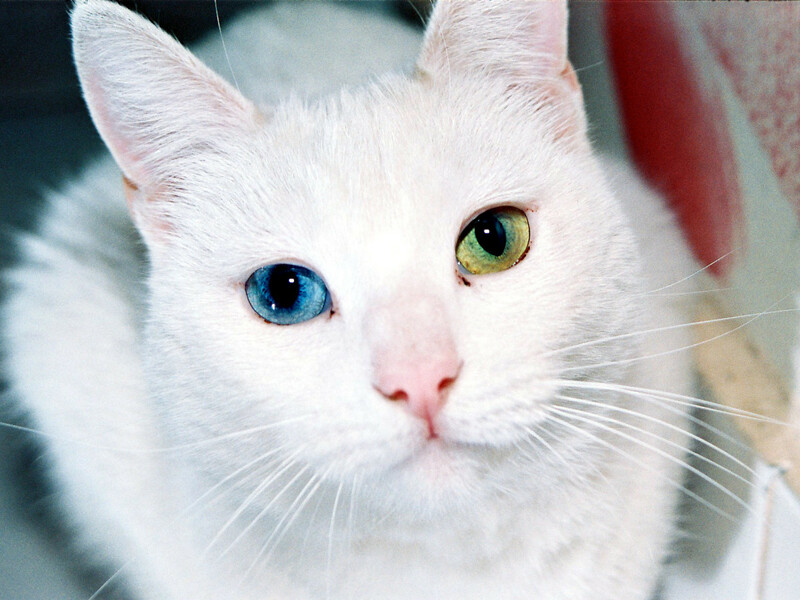 However, if it turns out to be an eye issue, as with all eye problems, it's best to see a vet, or better, a board-certified veterinary ophthalmologist immediately to prevent potential vision loss. Did your dog bump its head? Or experience any other trauma? You might just need a cold compress on the eye for anywhere from a few to thirty minutes. Is the eye okay aside from the third eyelid showing? In that case, and if both eyes don't also react similarly to light, there might be a cranial lesion. 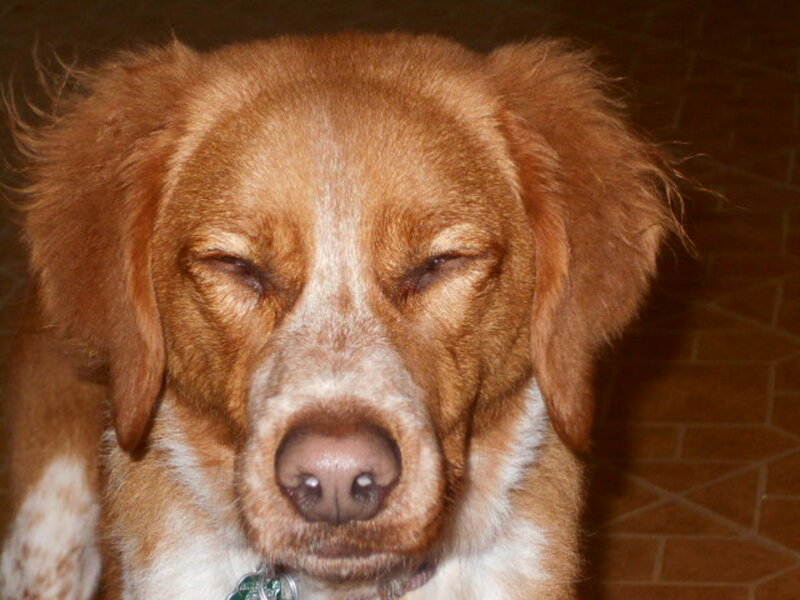 Is your dog struggling to keep that eye open? This might indicate an eye injury. Is there any discharge? This could be a sign of an eye infection. If your dog's third eyelid appears abnormal, please see your vet immediately for diagnosis and treatment. This article is not to be used as a substitute for veterinary advice. 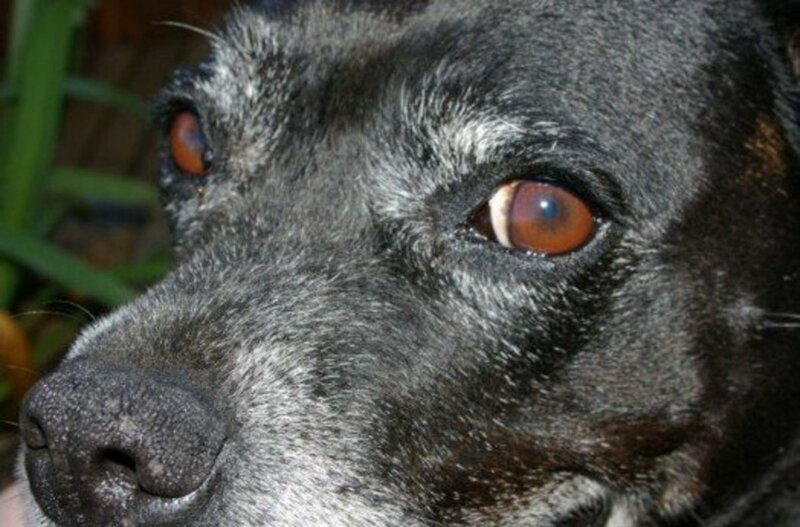 Did you know dogs have a third eyelid? No, this is new to me! Yes, I am well aware of it. I understood that 'shark eye' is a sign of stress. Is this the same as the third lid showing itself? 'Whale eye' or 'moon eye,' (I never really heard the term shark eye before) is the term used to depict dogs who are showing the white part of the eye, and yes, you are correct in that it can be seen in situations of stress or aggression. A classic example is a dog who is guarding a bone. The dog has his head lowered over the bone but he may be looking slightly sideways to make sure nobody comes near, and the whites of the eyes may be showing. The third eyelid showing is a different situation. This involves a different part of the eye which is the third eyelid which resides in the inner corner of the eye when the dog is alert and awake, but slides over the eye when the dog falls asleep or when the dog is feeling unwell or there is some neurological dysfunction. My dog had his teeth removed this week and he suddenly has this third eyelid, should I take him to the vet? He is also shaking. 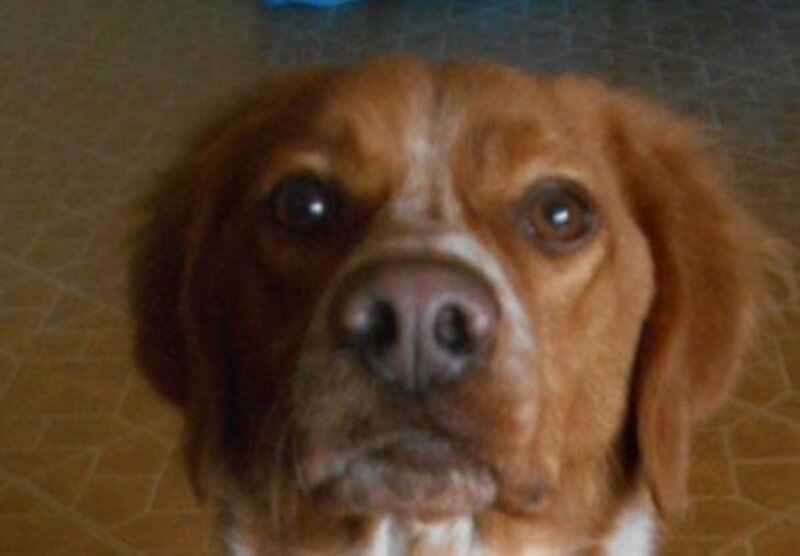 A friend's pup's third eye, just on the right side, seems to pop up but only when he is chewing on a toy or bone, then it goes away. Is this a cause for concern or a vet visit? Chris, I would think ruling out a tumor in the sinus and/or nasal cavity is important at this age. However, a sinus infection as a result from cleaning out the abscess can also be a possibility. A dental or skull xrays to check her sinuses and the area around the teeth may be insightful before proceeding with more expensive/invasive tests. On occasion, some extraction sites take a while to properly close and an opening from the mouth to the sinuses may play a role in causing the symptoms you are seeing. 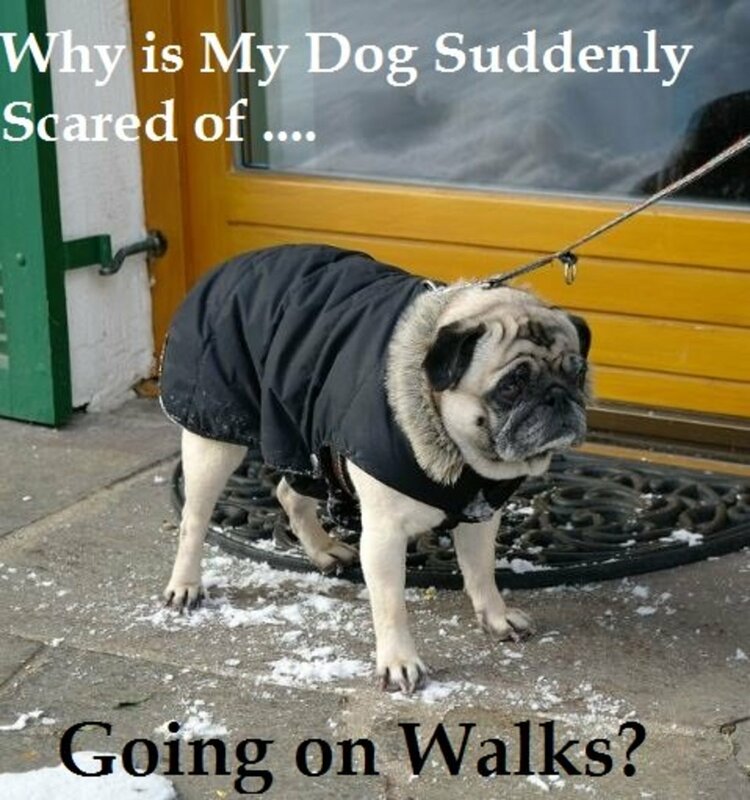 I hope this gets sorted out for you and your dog. My Shepard/boxer mix & she is 10yrs old just recently had her back left tooth extracted she was fine until the antibiotics had run out now her third eye lids are showing in both eyes & there is a white discharge coming from her eyes she also has green discharge coming from her nose & her energy levels dropped big time. we took her to the vet & they said that it's possible that she may have polyps or a tumor in her nose & the best way to know is if they do a scope or MRI I'm really worried about her but I am wondering if its possible that from the tooth it went abscess & the infection spread before they got to the tooth or if it's because of allergies the reason I ask is because she was fine on the antibiotics & now that she is off of them she seems like she's in a lot of pain. please help me & my wife out we love our dog like she is our daughter & it hurts to see her in pain. Hello Clauda, I hope the specialist gets your beagle's eye condition sorted out. At the vet hospital I used to work for, we used to have a very experienced eye specialist come once a week. People were traveling from far to see him. I remember he used to check eye pressure using a procedure called tonometry. Often, this helped confirm or rule out glaucoma. It's importatnt finding the underlying cause for the increased pressure in the eye. Best wishes for your boy. Hi - We are currently experiencing this with our beagle. It's heartbreaking because we have been tot the vet 3 times so far. His one eye has high pressure levels and we have some drops but they don't seem to be working. We are going to a specialist later this week. He doesn't seem to be in pain, but his eyes look terrible. Thanks for this article. It gives me an idea of what might be going on. My boxer/pit mix has had this corner ( eye lid?) happen before. It just came out and about an hour or so later fixed itself, usually after a nap. This time however he had it last night ,went to bed ,woke up fine. He's been awake for about 30 min.,and now it's back. I don't know what I should do. Can you help me...please... Thank you... Amy S.
9 y.o mini daschund has 3rd eye on both eyes, can't hardly open eyes. what do I do for her? 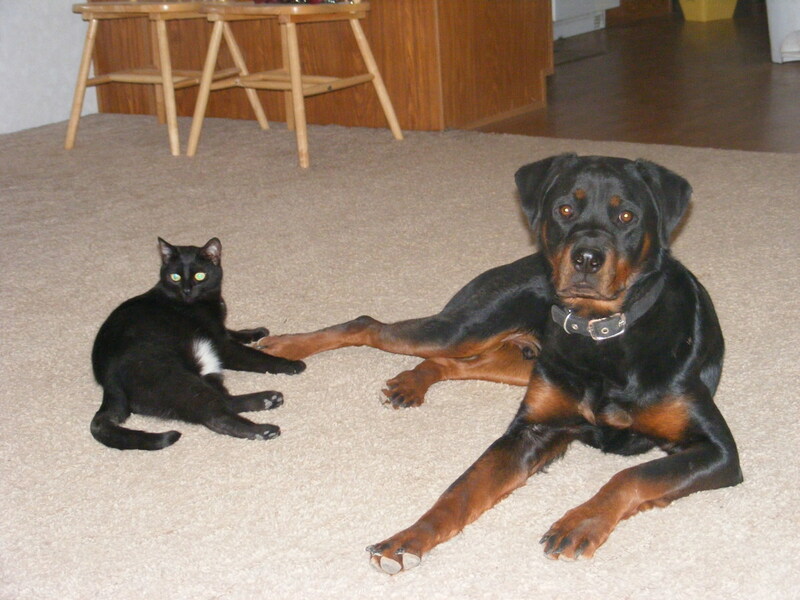 Kaedan you may want to see the vet so to investigate the underlying cause. My mini dauchshund’s third eyelid is appearing on her left eye. It is morning when I posted this and we both woke up but what do I do if it stays there? Ken, a third eyelid showing is not a sign of old age, I would have her checked out. My beagles third eye lid is almost half way covering her left eye, despite her being fully awake and alert .She is of old age so I'm wondering if something is wrong and should take her to the vet or is it just her old age? The third eyelid being seen is common in Saint Bernards and Blood Hounds. My 7.5 month old puppy has always had his showing and looks to be part Blood Hound. Should this be concern? Is she spayed or intact? 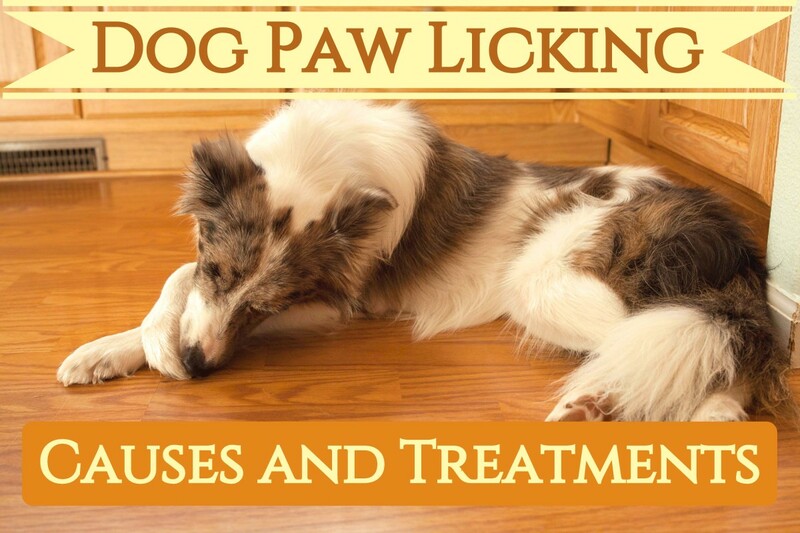 It could be something is going on medically, see your vet to be sure and mention the odd behaviors you are seeing, It could be an early sign of canine cognitive dysfunction or some sort of pain. Hello, I would report to your vet that there has been no improvement and perhaps consult with a specialist if the issue remains unresolved. My hounds third eyelid became exposed 3 days ago. Took him to the vet the day it happened and ran tests. No damage to his eye. Started him on drops and anti inflammitories. 3 days and no improvement. He is 8 years old, so maybe it may take longer, but I am beyond sick with worry. This is my boy. Any words of wisdom??? My golden retriever is pregnant (day 54) and this has just started happening to her as of last night. Could it be to do with the pregnancy? My I'll dog woke up one morning with his Horner's Syndrome. He has lymphoma and I do not know how long he has to live. My animals average 22 years. I baby them. The morning I noticed his eye, every 1 to 2 hours I used human Blink drops (an eye moisturizer (over the counter) that I use because I have dry eyes) and by the next day IT WAS GONE. Everything I read given his poor health said it would not go away. I recommend trying this to everyone. Will not hurt your animal. Natural saline. The surgery could be a culprit if your dog is not feeling too well or is dehydrated. Whether it clears up or not depends on the underlying cause. I would mention it to the vet that did the surgery. It's difficult to say if it's painful as it depends on the underlying cause. Age may be a culprit indirectly, meaning that older dogs are more prone to having certain medical conditions that may cause it, best to see the vet. Would the op have caused this? He didn't have it before hand and will it clear up? My dog is 10 years old and her third eye is showing in both eyes. Could age be a reason for this. Is this painful? According to the link below "DLE can also cause inflammation of the third eyelid." In this case, the underlying issue needs to be addressed. Our sheltie was recently diagnosed with Discoid Lupus. Does this cause the appearance of the 3rd eyelid & if so should it be treated? I would get this checked out by the vet just to make sure. I got a puppy who was 10 weeks old. .. her third eyelid in both eyes has always been showing ... she's not in pain no discharge no smell no redness... any ideas?? Yes, it was cherry eye. She recovered well, but she hates having her photo taken. Maybe it's because of the flash on her eye. Did she have cherry eye? I hope she is doing well after surgery, thanks for stopping by! My dog Ashley Pumpernickel had that. I never knew what caused it but this article helped me understand the third eyelid better. Eventually she needed an operation to have it removed. I was wondering why our Akita had that! He has been gone for years. Thanks for the info. Cool little piece of trivia I did not know. Voted up and Interesting!